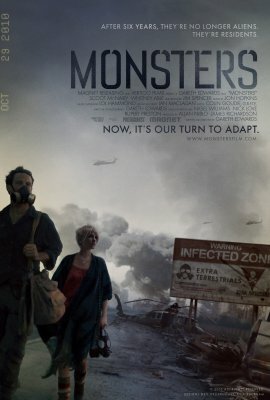 Tweet On October 29th Gareth Edwards’ “Monsters” hits theaters. The writer and director first thought of making a war of the world type movie but when “Cloverfield” came out, Edwards dumped the idea. Thank goodness for that. That’s because Edwards was able to redefine the horror genre with a movie that is being hailed as one of the scariest movies ever. Edwards recently stopped by to discuss the film. Q – How did you get your start in television and film writing? A - I went to film school with the intention of making a great short film that would instantly be picked up by Hollywood and I’d then become a movie director. Sadly, it wasn’t that simple. But my flat mate at University was studying this new thing called ‘computer animation’ and even back then in 1996, it was clear that this could be the answer of how to make a film on your own if Hollywood never came knocking. So I bought a PC and got massively sidetracked creating computer graphics for TV companies. I did a lot of things for channels like the Discovery Channel, and then used this skill to bribe producers into letting me direct their shows. If they did, I do all the visual effects for dirt cheap. I showed some of these FX heavy shows to Vertigo in the UK with my idea for “Monsters” and thank god, they went for it! Q – Your new movie “Monsters” is due out this year. What was the inspiration behind this? A - Originally I was going to fund it myself with the money I’d saved doing computer graphics. So I was looking for an idea that could abuse this skill, but would be really cheap to make. My first thought was a war of the worlds type invasion, all shot on a camcorder, but after writing it up the “Cloverfield” trailer came out, so I had to bin that approach. Then I was on holiday and I saw some fishermen struggling with a net in the ocean. In my mind I pictured them pulling up a giant tentacle creature; obviously the men could not see what was in my mind and carried on as if it was normal. Suddenly I was struck by an image of a giant tentacle monster being surrounded by fishermen who were acting like this was completely normal, I thought, that’s it, I’d go see that movie! Q – The premise involves alien life forms within our solar system. Do you believe in aliens? Why or why not? Q – How long did it take to write the screenplay given that extensive research on the subject had to be done? A - We had three months from when the film got ‘green lit’ without a script to when we started filming in Mexico. Q – I read that “Monsters” is 2010’s “District 9.” Is this a fair comparison? A - I can see why the marketing team on “Monsters” would like to make that comparison, but I think the films are very different beasts indeed (excuse the pun). We were in Mexico halfway though filming when we read an announcement on the Internet that Peter Jackson was going to make a film called “District 9.” We had also picture-locked, which means finished editing, before “District 9” was released in the cinema; it just took me a lot longer to complete our CGI as I had to do it alone. But, I think Neil Blomkamp is a bit of a genius! And I for one would go to see his next movie. I think there’s enough room in the moviemaking for everyone. I’m sure we’re gonna see a lot more of these ‘gritty’ CGI type films coming along. I don’t care what they are as long as they come from the heart, not a studio trying to cash in on a new craze. Q – You also directed the movie. Do you look at it differently as a director than as you do as the writer? How were you able to compromise on what to change or take out or add in? A - When you cut your favorite shot out of a film, you know it must be going well. It’s important to not be attached to anything in the edit. It’s like being a surgeon and operating on your own child. This is why I hate filmmaking, it’s not fun. It’s often very stressful. It’s like carrying out open-heart surgery on your own children. But I love my (metaphorical) children, so the pain is all worth it. I love conceiving films, and I love showing them, but everything in the middle is just nerve racking as it’s the bit when it can all go wrong. Q – I’m looking forward to seeing this film. Anything you wanted to add? A - Be prepared for a relationship, and a road-movie, and not a Hollywood action-packed thing with slow-motion explosions.